Freelance sites are filled with all kinds of different jobs in absolutely every industry imaginable! There are data entry, writing, virtual assisting, transcription, and customer support jobs posted all the time, and those are just the tip of the iceberg. 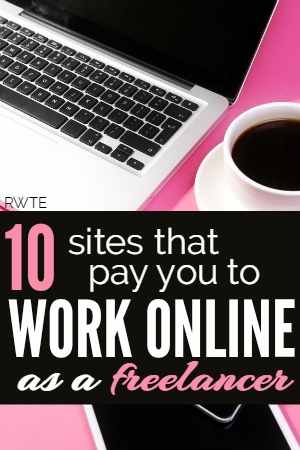 Each of these sites are similar in many ways, but there may be a few differences as far as how pay works and what methods of pay are available. These are also great options for work at home if you are not located in the U.S. as most of these are open worldwide. Freelancer – Lots of project-based work in many different industries. Several payment options available. Konsus – Read Konsus Review – Not a bidding site. You apply and if accepted, you're eligible to work on projects through Konsus. FreeeUp – Read FreeeUp Review – They source freelancers to do work for their major clients. Earn $5 to $50 an hour. Positions can become long-term. Fiverr – Read Fiverr Review – Open worldwide. List anything you'll do for $5. Also check out this post with tips from top Fiverr sellers. Upwork – Read Upwork Review – I have personal experience with Upwork (formerly known as oDesk). Tons of work available in lots of different categories. Lots of different methods of pay available, and open to many different countries. Hourly and fixed price assignments. Guru – Simple interface, SafePay system in place. Lots of US-based workers. People Per Hour – Open worldwide but with a focus on US/UK. Submit proposals for freelance jobs you'd like to do or create hourlies posting what you can get done in an hour and for how much. Pays in bank transfer or Paypal. Project 4 Hire – Lots of designing, programming, and writing jobs. Escrow system in place for payment. They take a five percent commission from your earnings when you're paid (this is not uncommon with these sites). Translators Town – Just like most of these other freelance sites except you bid on translation jobs.